I’m quite proud of my Sweet and Sour Cabbage Borscht. I’d never made it–and was pleased with how well it turned out. It started with a trip to Rochester, New York, and a visit to the farmer’s market with autumn fruits and vegetables. I couldn’t resist bringing home a nine pound cabbage. 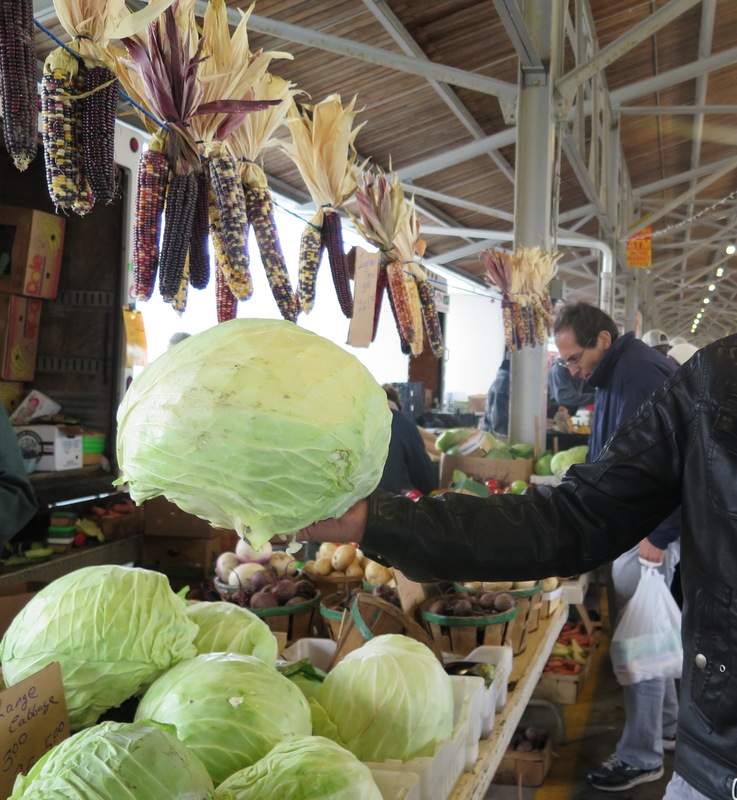 What should I make with the huge cabbage? My mother-in-law suggested cabbage borscht. Our adventure started with a trip to Rochester, New York, in October. With time to explore the city, we stopped at the farmer’s market on Saturday. I was impressed with the number of farms in northwestern New York and the produce in the market. This city is close to Lake Ontario with fruit orchards and vegetables grown in the surrounding area. 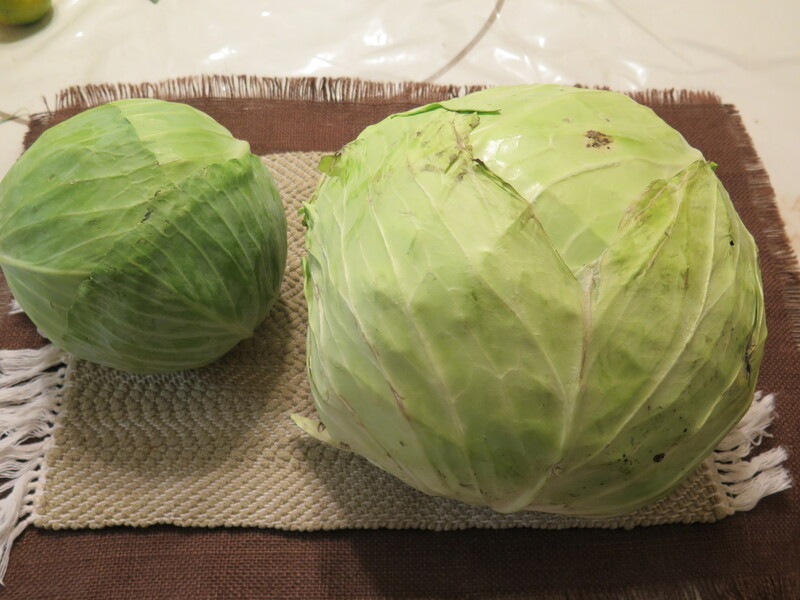 I brought home several vegetables and apples including the cabbage. Okay, so I’m a little crazy. For reference, Rochester is where the Eastman Kodak Company is located and it is two hours from Niagara Falls. A nine pound cabbage is equivalent to three or four ordinary cabbages. A cabbage salad might only use only one pound of cabbage. To come up with recipes, I queried relatives and neighbors. My mother-in-law, whose grandparents were from the Ukraine, remembered a sweet and sour cabbage borscht she’d enjoyed at a Jewish deli. My neighbors contributed stuffed cabbage served with sauerkraut and beef short ribs from Hungary. A niece with Vietnamese family immigrants suggested a Far East-Southern fusion of braised cabbage with bacon and fish sauce. Yum. Of course, Louisiana cuisine contributes coleslaw and fried catfish. My favorite is cabbage salad with poppy seed dressing. With the cooler weather of this fall, it’s a good time to cook soup. Borscht is a hearty soup which originated in the Ukraine and it translates to “soup.” Traditionally it is made with beets. Other ingredients such as tomatoes, cabbage and potatoes can be added. It is served either hot or cold. A variation is made with cabbage and the beets are omitted. My husband’s maternal family immigrated from the Ukraine in the 1800’s and settled in Minneapolis. They came through Philadelphia and changed the family name to “Franklin” in honor of Benjamin Franklin. I’m sure my mother-in-law ate similar foods when visiting her Ukraine/Russian relatives in Wisconsin when growing up. My mother-in-law enjoyed the cabbage borscht at the Jewish deli, but she never made the soup herself. So we looked on the internet for similar ideas like she remembered. I lined up several of the recipes for comparisons of ingredients and quantities and came up with a simplified version. Beef Short Ribs. Most of the recipes used beef short ribs for the meat. 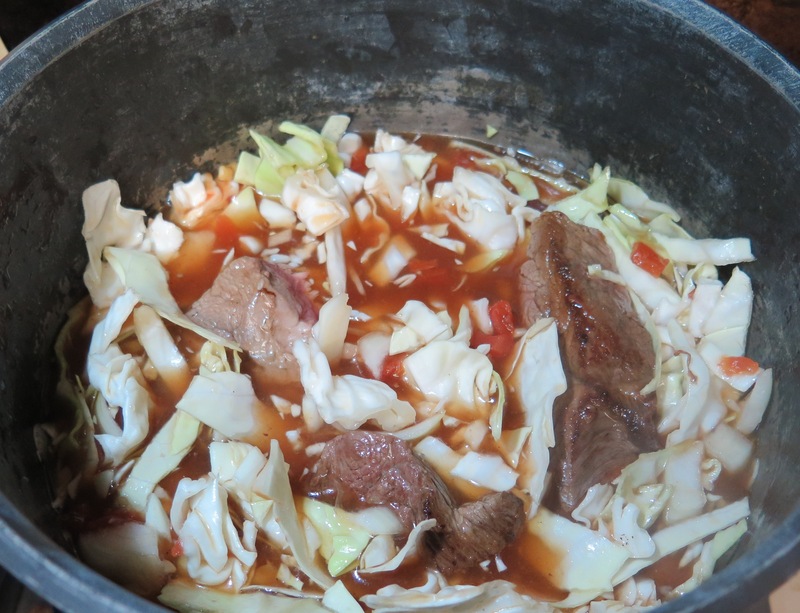 The soup is cooked for several hours until the meat is tender. Then it is taken off the bones, shredded and added back to the soup. The bones add a hearty, meaty broth flavor. I wouldn’t substitute an other cut of beef. The short ribs give the soup a distinctive flavor. For simplicity, I used boneless short ribs, searing the meat chunks to seal in the juices. This speeds up the soup preparation as you don’t have to skim foam off the broth as when meat with bones are used. To compensate for boneless meat, I used beef stock for flavor. Swanson had a MSG-free variation which I tried. Monosodium glutamate is a flavor enhancing ingredient often added to commercial bouillon cubes and broth. There is still a nice flavor without the MSG. This stock does have plenty of salt in it, so no extra salt is needed in the soup. 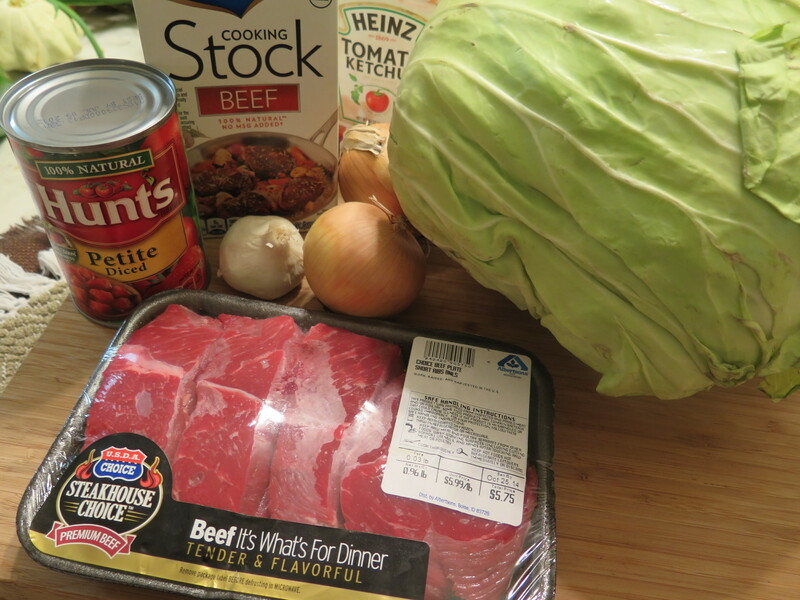 Cabbage and Stock Proportions. Most recipes called for “an average cabbage.” Cabbages vary in size and density, so I suggest weighing or measuring produce ingredients. I used 2 lb shredded cabbage. 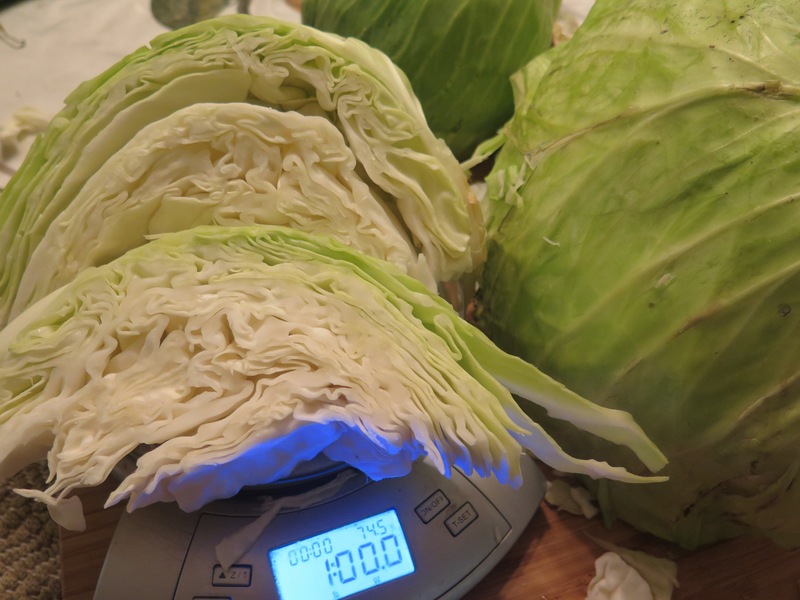 Here is 1 lb cabbage wedges. An average amount of stock was 3 quarts (this is 12 cups). I used 32 oz beef stock (which is 4 cups) and added 8 cups water. This yielded enough broth so that there was ample broth and still plenty of cabbage in each serving. Tomatoes. Some soup recipes used tomato sauce, others used fresh tomatoes and one used ketchup. Hum, I thought that ketchup was an interesting ingredient. It does add a spicy flavor. I used a combination of ketchup and canned diced tomatoes. I wanted tomato flavor but not a thick tomato taste. I don’t like to have parts of unopened cans sitting in my refrigerator, so used the entire can of tomatoes with the juice. Sweet and Sour. The striking difference to this soup is the sweet and sour taste. For the sour flavor I found vinegar, lemon juice and citric acid tablets used. The sweet taste came from sugar or brown sugar. I find that, in general, equal parts of vinegar/lemon juice and sugar give a good balance. I tried lemon juice and brown sugar. This worked well. Other flavors. Of course, I added onion, garlic and black pepper. But there really weren’t other ingredients in the reference recipes. Not any added oil or fat. It’s a low-fat soup! Simple! This is a simple recipe. I browned/seared the meat, chopped the cabbage, onions and garlic and opened a can of tomatoes. Combine all the ingredients and simmer several hours on the stove. Enough to eat for several meals–or freeze the leftovers. Cut off any membrane from surface of beef short ribs, if applicable. In small skillet, heat oil on medium high heat and sear beef short ribs on each side for several minutes until brown. Set aside. There should be 4 to 5 chunks of meat. In a large stock pot, add shredded cabbage, chopped onion, minced garlic and combine. Add the beef stock, diced tomatoes with juice, ketchup, lemon juice, brown sugar and black pepper and stir to combine. Add the beef short ribs. Bring to boil on stove, then turn to low heat; simmer and gently boil for 2 hours, partially covered with lid. Stir occasionally. Cook until meat is tender. Remove meat chunks and shred the meat. Recombine with the soup in pot. Serve in individual soup bowls, garnish with parsley, if desired. Raw cabbage stores well, but it is most nutritious when first picked. (This soup also freezes well.) 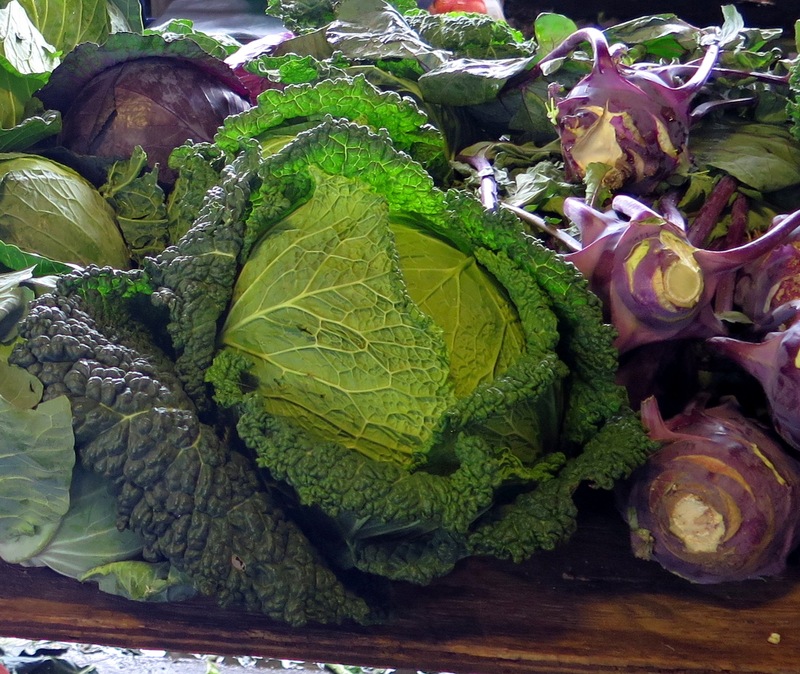 I’m enjoying all the produce from the Rochester Public Market and am busy making some of the other recipes using the remaining cabbage which I will feature in future posts. In the meantime, we are enjoying the cabbage borscht! 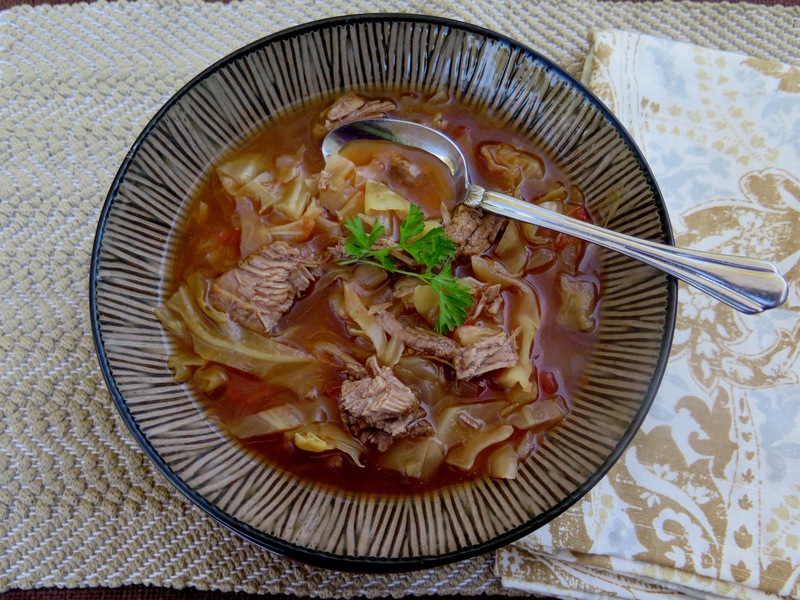 This entry was posted in Easy Homemade, Family Favorites, Recipes, Travels and tagged easy recipes, farmers market, hearty soups, Rochester Public Market, sweet and sour cabbage borscht by Maylee at Beyond Gumbo. Bookmark the permalink. How much sour salt would substitute for the 1/3C lemon Juice? Interestingly, this is from my mother-in-law who was Jewish Russian and German ancestry. There are many similar dishes with Mennonites — I have Dunkard background, similar to Mennonites. Great dishes! What are your favorites?